theScore's Gianluca Nesci spent five days in Catalonia ahead of the recent Clasico between Barcelona and Real Madrid. You can find the complete collection of stories from the trip here. BARCELONA - Inside Barcelona's dimly lit museum, you'll find everything from Champions League trophies - all five of them - to a shrine of Lionel Messi's many accolades. Black-and-white photos, vintage shirts, and old, bulky boots that look more appropriate for a construction site than a football pitch, too. They're all there, playing host to thousands of visitors every day. But just a block away from the crowded showroom, there's another Blaugrana temple that houses its own impressive collection of souvenirs. Maria Plaza, who runs Can Fuste with her husband, Carlos Fernandez, said the many Barca players who frequent the restaurant "love" the ham. There's mounds of it, thinly sliced and served with pa amb tomaquet, a staple of Catalan cuisine that consists of toasted bread, rubbed with olive oil, garlic, and tomato, and finished with salt. The deliciously simple appetizer makes way for an endless array of delights: fried croquettes, crunchy on the outside and soft on the inside; a hefty portion of monkfish, buttery and tender; traditional Catalan sausage - known as butifarra - that's aromatic and filling. Together with the proximity to the Camp Nou - it's about a 10-minute walk east of the cavernous stadium - those classic dishes have seen the local hotspot solidify its position at the center of the Venn diagram that links the city's culinary and football circles. 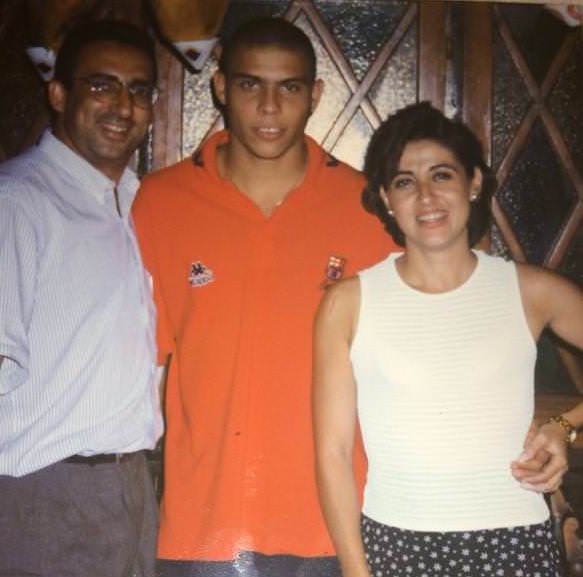 Plaza, 51, whips out a photo of her and Carlos posing with a young Ronaldo. "He doesn't look like that anymore," she noted of the Brazilian, putting her hands to her stomach. "Now he's fat." Like Ronaldo's rotund physique, plenty has changed over the years. But at least one thing, according to Plaza, has remained the same: her enthusiasm for her craft. Watching her work is captivating. She scurries back and forth, hustling from the kitchen to the front of the house with gusto. It's performance art; dropping off an appetizer here, delivering another drink over there, making multiple pit stops in between to crack a joke with one of the regulars - of which there seem to be plenty - or check in on the new faces. She spins around a waiter, pivots, dashes off into the kitchen, and then quickly remerges with a plate in each hand. Jordi Alba, Barcelona's jackrabbit of a left-back - and one of Plaza's favorite players - would appreciate the energy. "He's lovely," she says of the dynamic defender, her eyes lighting up. Meanwhile, her husband - described by Plaza as the gastronomic heart of the operation - waltzes through the space with efficiency, if not the same intensity. Like Sergio Busquets, Barca's unhurried fulcrum, he's calm and deliberate. Together, they've kept Barcelona stars and supporters consistently coming back. Particularly for the footballers, the restaurant has been an institution since Plaza's father, Miguel, opened the doors in 1973. Leafing through a collection of photos and autographed memorabilia, Plaza reveals a Rolodex of players, both past and present, who regularly visit Can Fuste. Gerard Pique, Luis Suarez, and Ivan Rakitic. Vitor Baia, the other Luis Suarez (the current version's Spanish predecessor) and Hristo Stoichkov, too. Plaza considers all of them family friends. "Pique comes in here like it's his home, announcing himself to everyone. He goes to the kitchen and asks what's for dinner," Plaza said. "He's an actor, not only a player. All the time he's acting. He's special." "Never," Plaza said when asked if Messi has dined at her restaurant. She has the look of a parent about to deliver the classic "I'm not angry, I'm just disappointed," line. One day, maybe. Messi's continued absence is an outlier, though. Enrique Castro Gonzalez, known colloquially as Quini, lived directly above Can Fuste in the 80s. The Plaza family was right next door. It should come as no surprise that the abduction of a neighbor had a direct impact on their lives. "We were very, very close," Plaza says of the two clans. As outlined by the Guardian's Sid Lowe, recalling the ordeal in great detail after Quini's death, the kidnapping wasn't exactly a high-brow operation. The kidnappers also had no idea how to arrange for the ransom money to be delivered. No account had been set up - Barcelona had to do that for them - and they had no idea how to make good their escape ... The kidnappers made the occasional threat, even though one of them promised Quini that nothing would happen to him, adding: "I'm even a Barcelona fan." Not the brightest bulbs around. They held Quini for 25 days in Zaragoza, cramming him into what Lowe describes as a "small, damp" makeshift cell. The sharp-tongued Plaza draws up a description of the ragtag crew of bandits: "Stupid guys who never kidnapped anyone before." Plaza said her father kept the doors of the restaurant open "all night" in order to help with the rescue effort. It turned into the de facto nerve center for the investigation; police, journalists, family, and friends congregated at all hours of the day. For the nearly month-long spell in which Quini was missing, Miguel relayed both messages and, naturally, food to Maria Nieves, the striker's wife. 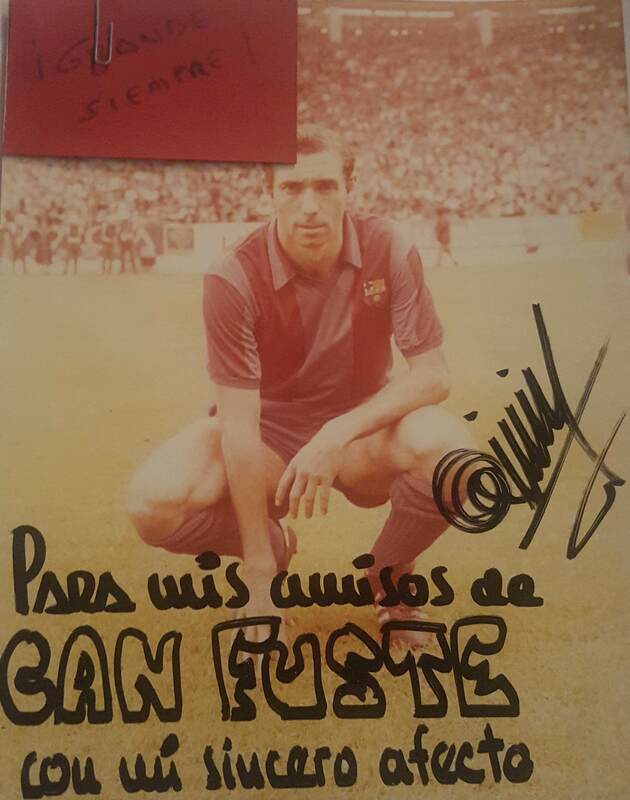 "For my friends at Can Fuste with my sincere affection," Quini wrote on one photo after he was rescued. Incredibly, he still won the Pichichi that season. He even went on to score twice in Barca's victory over Sporting Gijon, his beloved former club, in the Copa del Rey final. 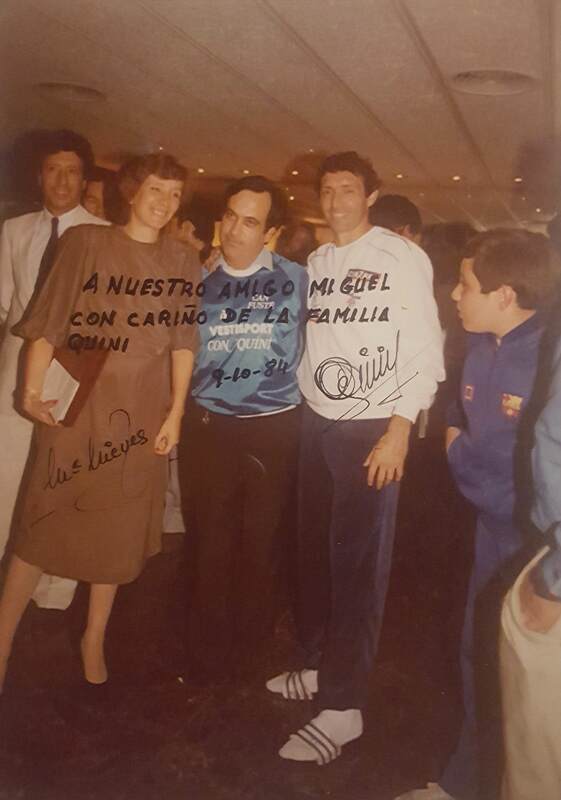 "To our friend Miguel with love from the Quini family," says another autographed picture that Plaza proudly shows off. You won't find souvenirs like that in the official Barca museum. Plaza's restaurant is unabashedly pro-Barca. It's been that way since the beginning and remained so since she took the reins after her father's death in 1989. Steadfast as Can Fuste's high-profile clientele has been, though, the football culture around the eatery has changed. "Players always come individually, never together," Plaza said of today's crop of stars. "That's a big difference between players from 30 years ago and players today." Carles Puyol and Iker Casillas, two stalwarts of Spain's golden generation, typified that difference. Prior to a Clasico, the respective captains of Spanish football's two behemoths would meet at Can Fuste for what Plaza described as a "friendly" lunch. Imagine current Real Madrid captain Sergio Ramos, who's despised in these parts, and ... just about anybody from Barcelona going out for a meal together. El Clasico, at least from the outside, feels like it's growing in petulance every season. The contest was always fierce, no doubt - the political undertow of the match will ensure that never changes - but with Puyol and Casillas, there was a sense of mutual respect, even if it was only between those two compatriots. The rivalry, contrary to popular belief, could be civil. "It's no problem," she said, shaking her head. "We never fight about football." Allegiances within the household weren't always split, though. As Plaza explained, Carlos backed Barcelona for many years. His fandom was tied to legendary defender Migueli, who is both his cousin and, not coincidentally, his favorite player. Affectionately known as "Tarzan," the mustachioed defender spent 16 years at the Camp Nou, playing 664 matches and winning 12 trophies. Brave in the tackle and dominant in the air, he was the type of heart-and-soul leader that could inspire a cult following, regardless of one's bloodline. His decision to retire in 1989 was the impetus for Carlos' choice to cross the bitter divide. Free of those familial ties, he swapped blue and garnet for white. Unlike Luis Figo, he's never had the severed head of a suckling pig thrown at his feet as a result. Not yet, anyway. But when Barcelona play at the Camp Nou, Plaza said her husband temporarily rediscovers those Blaugrana roots for one simple reason: a home win for the Catalan giants is a boon to the restaurant's bottom line. "When Barcelona win, we work more," she said. The latest edition of El Clasico, then, couldn't have gone any better. When mohawked midfielder Arturo Vidal rose high in the waning minutes, crashing a header beyond the flailing limbs of Thibaut Courtois for Barca's fifth tally, it's not difficult to imagine the reactions of both Maria and Carlos. The former would have been overjoyed. The latter, you can only assume, begrudgingly content. As some 90,000 partisan fans emerged from the Camp Nou, sprawling out onto the streets after Barca's battering, the pair prepared for the punch-drunk horde.